Take away the safety net, step out of your comfort zone and grow. That was my plan when I set out to do the Washington Backcountry Discovery Route (WABDR) on my own. I had always dreamed of solitary overland travel by motorcycle the same way I dreamed of hiking alone. These solo excursions both have a certain romance, added danger and an excitement factor that is not present when traveling in a pack. I had been intimidated, as well intrigued by traveling alone. 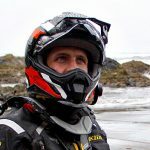 After spending several years and thousands of miles developing as a rider, I felt confident enough to take on this challenge. Growing up trusting the buddy system and hearing that there is safety in numbers can lead to certain misgivings when planning a trip like this. What if this happens? What if that goes wrong? The added risk of being alone felt significant. Modern technology like satellite two-way communication and GPS navigation (both of which always accompany me on backcountry trips), however, made this risk more manageable. Nonetheless, rolling onto dirt by myself the first day of my trip felt very liberating. Being out of your comfort zone means you are improving as a rider, but I also felt I was growing as a person. Every decision became my own. When do I want to take a break? Whenever. Where do I want to camp tonight? Wherever. What pace do I want to keep? Whatever feels comfortable. Don’t get me wrong, I love the camaraderie that goes along with traveling in a group or with a significant other, but you never realize how many decisions are shared until you alone manage the adventure. This allowed me to relax more than I had ever found possible on a motorcycle trip like this. Traveling solo in remote areas with only my motorcycle and nature to confide in enabled me to retreat into the deepest recesses of my mind. I was able to internalize and process all of the beauty at hand like never before. Not having other people along meant less distractions and more appreciation for the scenery. It’s not for everyone, and it’s certainly riskier than having a traveling partner, but I think everyone should try it at least once. If for no other reason than to rule it out as something they would enjoy. Some people won’t like it after experiencing it, but for those of us that enjoy solidarity, it will be exhilarating.